French Meadows Low-Level Outlet Cylinder Replacement - Global Diving & Salvage, Inc. Global performed emergency repairs to a leaking hydraulic system. The repairs were completed at a depth of 175 feet at an elevation of 5,400 feet. With altitude corrections, diving depths were equivalent to 200 feet. 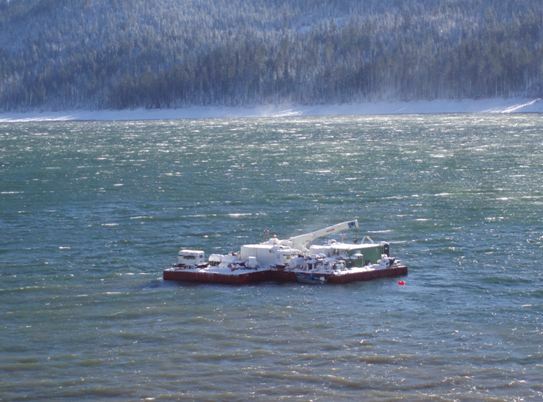 To accomplish this task, we mobilized all aspects of a mixed-gas diving spread to French Meadows Reservoir in December 2006. Together with PG&E personnel, we replaced the existing 14″ hydraulic cylinder and portions of the existing lines. After its replacement, the new cylinder and hydraulic system required less than 1/3 of the original hydraulic pressure to operate the gate. The project was conducted over a three-week time frame involving 25 dives without incident. 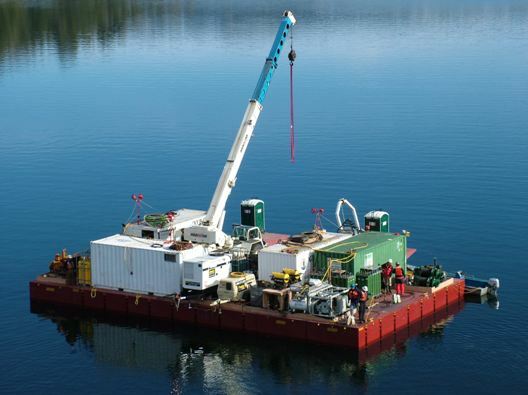 We were responsible for providing cranes, barges and environmental controls for the operation. The operational considerations included -30 below zero temperatures and extreme snow accumulations. A major concern of all parties was the potential release of hydraulic fluids into the lake. All diving and operations were conducted safely and without incident in the extremely harsh deep-diving environment. Environmentally, the project was conducted without incident.